For the first time, researchers have produced terahertz waves—a form of electromagnetic radiation in the far infrared frequency range—from liquid water. Xi-Cheng Zhang has worked for nearly a decade to solve the scientific puzzle that many in the research community believed to be impossible. Terahertz waves have attracted increased attention recently because of their ability to nondestructively pass through solid objects, including those made of cloth, paper, wood, plastic, and ceramics, and produce images of the interiors of the objects. Additionally, the energy of a terahertz photon is weaker than an X-ray photon. Unlike X-rays, terahertz waves are non-ionizing—they do not have enough energy to remove an electron from an atom—so they do not have the same harmful effects on human tissue and DNA. Because of these abilities, terahertz waves have unique applications in imaging and spectroscopy—everything from discovering bombs in suspicious packages, to identifying murals hidden beneath coats of paint, to detecting tooth decay. Zhang’s research group uses lasers to generate terahertz pulses via interaction with a target. 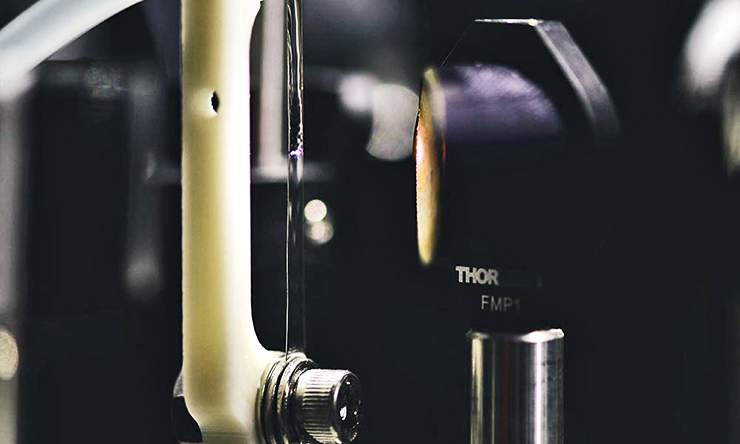 In this case, the target is an extremely thin film of water—approximately 200 microns or about the thickness of two pieces of paper—created using water suspended by surface tension between two aluminum wires. 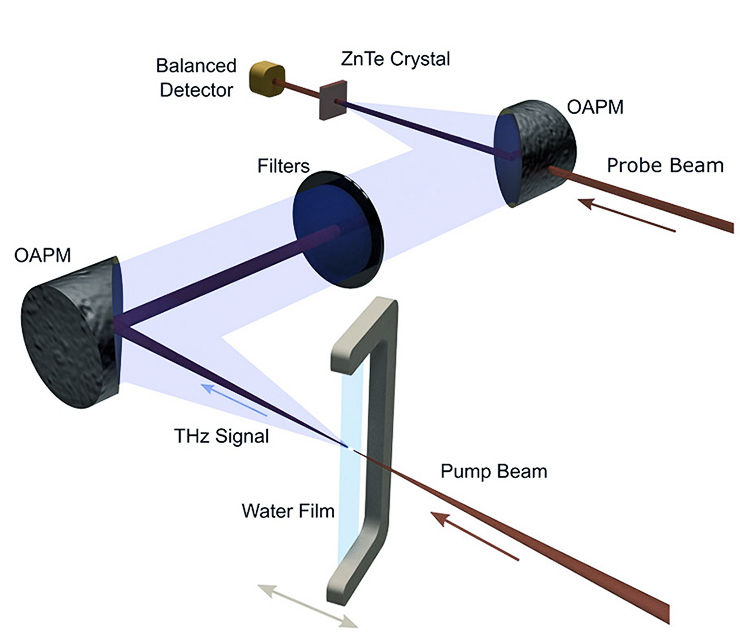 Researchers focus a laser into the water film, which acts as an emitter for the terahertz radiation output. Previous researchers have generated terahertz waves from targets of solid crystals, metals, air plasma, and water vapor, but, until now, liquid water has proved elusive. In fact, when researchers measured the terahertz waves generated by the water, they found they were 1.8 times stronger than the terahertz waves generated from air plasma under comparable experimental conditions. Because water is such a strong absorber, however, many people in the research community believed it would be impossible to use water as a target. Zhang himself has spent years attempting a solution, and he found a fellow stalwart in Qi Jin, now a PhD candidate in optics at the University of Rochester and the lead author of the paper. One of the challenges was creating a film of water thin enough that the terahertz photons generated by the laser beam would not be absorbed, but thick enough to withstand the laser’s energy. Along with Yiwen E, a postdoctoral associate in Zhang’s research group, Jin spent months optimizing the thickness of the water film and the incident angle, intensity, and pulse duration of the laser beam. The researchers report their findings in the journal Applied Physics Letters. Grants from the Army Research Office sponsored the research.